I’ve been able to put more time into my independent study over the last few weeks. While that’s plenty of work for me, I’ve decided to do a little experiment during the process: dump Microsoft Word and instead write it online using Google Docs. So far, I like Google Docs. A lot. 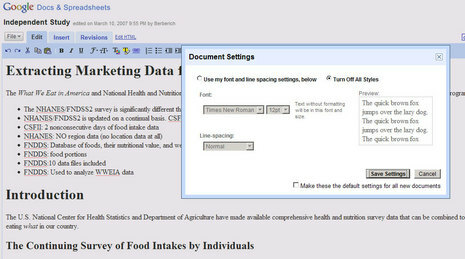 I love being able to get to it from any of the computers I use, and it has all of the major functionality I need out of a word processor for a research type paper. It’s also got automatic saving, a revision history, and really good collaboration/sharing tools. So, when I want my advisor to give me some constructive criticism, I can give him access to view and comment from where ever he happens to be that day. At this point in the process I’ve turned off all formatting options so I’ll avoid the temptation to tweak fonts and styles and instead concentrate on the content. I’m writing a good percentage of the paper in HTML editing mode, where I can directly modify the document’s source. 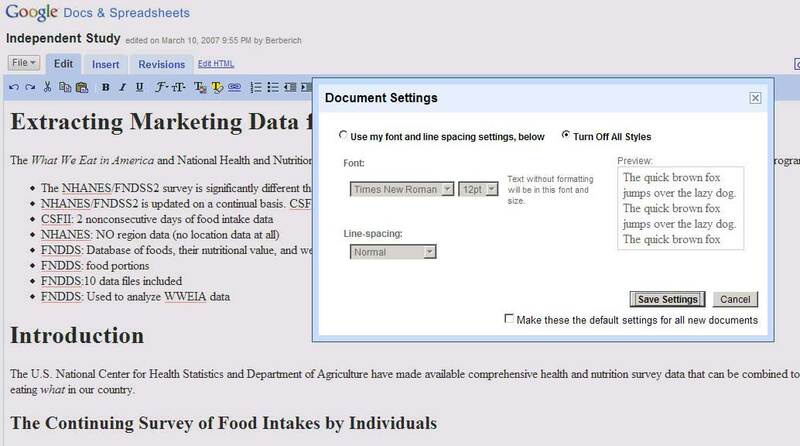 I love the fact that documents are stored as plain old HTML instead of in some proprietary format like MS Words. It means that publishing to my website at the end will be very simple.